The floating receptor hypothesis resulted in the prototype model of 7TM receptor action, namely the ternary complex model (first published by DeLean and colleagues [ 29]) . This describes a receptor that, when activated by an agonist, moves laterally in the cell membrane to physically couple to a trimeric subunit referred to as a G protein. 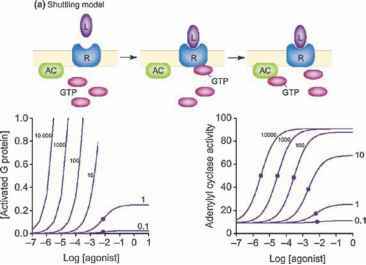 Supporting this model were data showing that physical complexes between receptors and G proteins could be isolated after addition of agonist to receptor systems (i.e., References 30, 31). The prevalence of this mechanism (receptor protein that recognize external ligands and transmit signals to cellular GTPase heterotrimers called G proteins to elicit response) led to the pervasive name for 7TM receptors from that period as G protein-coupled receptors (GPCRs). Receptor behavior that was inconsistent with the ternary complex model was observed nine years after its description; this was the impetus for the publication of the extended ternary complex model . Specifically, Costa and Herz  noted that a peptide opioid receptor antagonist selectively reduced the basal level of NG108 cells containing ^ opioid receptors and that this behavior was due to the reversal of elevated basal tissue response due to receptors that spontaneously formed an active state. There was no provision for spontaneous non-ligand-dependent activation of receptors in the original ternary complex model; thus, a new model had to be devised: this was the extended ternary complex model. where Ka and Kg are equilibrium dissociation constants (reciprocals of association constants). Figure 1.3b shows the effects of changing a on dose-response curves of a system with existing constitutive activity (shown as an elevated basal response which can be reduced by ligands with a < 1). Such ligands are referred to as inverse agonists. Formally identical effects are observed with changes in y values. The extended ternary complex model gives a vectorial quality to efficacy. As discussed above, efficacy can be described as a selective affinity of the ligand for various receptor states. Thus, a > 1 leads to positive agonism while a < 1 results in inverse agonism. This model has been referred to as a "two-state" model, probably because of the two unliganded species [R.] and [Ra]. However, this is a misnomer since the model actually describes infinite receptor states when the receptor is ligand bound; that is, the magnitude of y confers a unique affinity of the receptor for G proteins when the receptor is ligand bound. Under these circumstances, every value of y defines a new ligand-bound receptor state. A theoretical shortcoming of the extended ternary complex model is the fact that it allows only the activated receptor to form complexes with G protein. 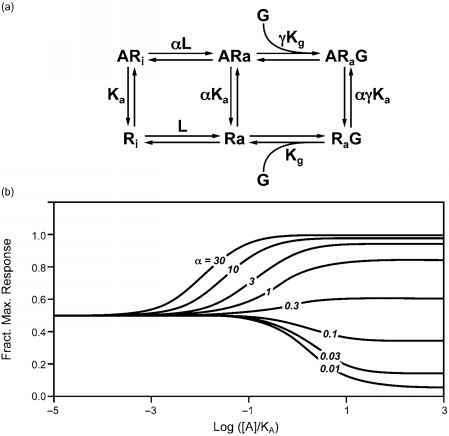 Thermodynamically, there is no reason a priori that all receptor species (active and inactive) cannot bind to G proteins; when this is added to the extended ternary complex model, a cubic model results where the receptors form the species [ARiG] as well as [ARaG]. The resulting model is known as the cubic ternary complex model [34-36]; this is a more rigorous and thermo-dynamically correct model, but it is more difficult to use since there are a greater number of parameters that cannot be independently estimated. Figure 1.3 The extended ternary complex model for 7TM receptor function . (a) Schematic diagram showing a receptor that can exist in an inactive [Ri] and active [Ra] state; both states can interact with a ligand A and the active state interacts with G protein [G]. A variant is the cubic ternary complex model where the inactive receptor can also interact with G protein [34-36]. (b) Effects of ligands with varying efficacy (a values) producing the response-yielding species [ARaG] according to Equation 1.24 . This simulation shows a system with constitutive activity (basal effect = 0.5) and the effect of positive (a > 1) and inverse (a < 1) agonists. Figure 1.4 Pleitotropic coupling for 7TM receptors. (a) Various regions of the cyto-solic loops of receptors can bind to various cellular coupling proteins (i.e., G proteins, P-arrestin). Gray areas represent sites for receptor phosphorylation. (b) Coupling of three G proteins to opioid receptors; ordinates are density measurements reflecting amount of ternary complex (receptor, G protein, and opioid agonist D-Ala2,D-Leu5 enkephalin [DADLE]). Data redrawn from Reference 37.
major G protein families (a total of 10 G protein subunits)  . In general, the use of recombinant receptor systems made clear that most receptors could couple to multiple G proteins [39-44] ; it is not entirely clear to what extent these multiple couplings are artifacts of recombinant overexpression or physiological relevant fine-tuning of receptor signaling. The preceding discussion has focused on receptor coupling that results in activation of G proteins. Historically, the canonical view of GPCR signaling cascades places receptor activation in a queue preceding receptor phosphory-lation, binding of phosphorylated receptor to arrestin-family adapters, uncoupling from G proteins [ 45] . and internalization of those complexes to the endocytotic compartment . The binding to P-arrestin was thought primarily to serve the function of turning off the G protein signal. A major recent development in receptor pharmacology is the discovery of the ability of GPCRs to signal directly through the P-arrestin pathway to activate extracellular signal-regulated kinases (ERKs) through the formation of cytosolic "recepto-somes" [47, 48]. Under these circumstances, P-arrestins can be considered to act as multifunctional adapters and scaffolds enabling the recruitment of signaling molecules (i.e., ERK) and other assemblies in an activation-dependent manner [49, 50]. Thus, receptors are now known to produce activation of ERK1/2 pathways via G protein-dependent or G protein-independent pathways [51-53] . G protein versus receptosome signaling differs both from its cellular origins and temporal relationship to ligand stimulation. For example, parathyroid hormone (PTH) produces G protein-dependent and G protein-independent stimulation of ERK1/2. While the G protein component is transient, a temporally distinct long-lasting stimulation is produced by direct stimulation of P-arrestin by the activated receptor. Interestingly, different chemical analogues of PTH have been shown to selectively activate these separate signaling pathways. Thus, while [Trp) ]PTHrp-(1-36) selectively produces G protein-mediated ERK1/2 stimulation, [D-Trp12,Tyr34]PTH-(7-34) selectively produces P-arrestin-dependent, and G protein-independent, stimulation of ERK1/2 .